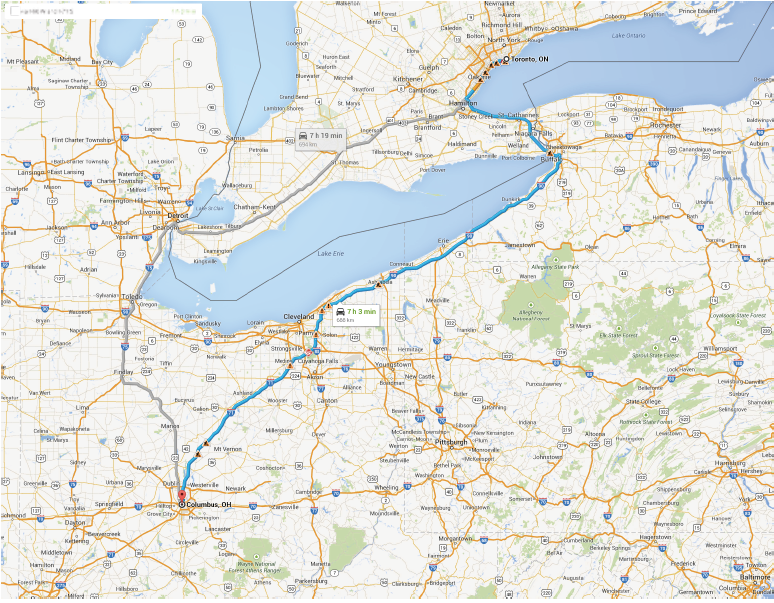 At 5am on June 3, 2014 I, Sydney Kodatsky, set off, on what Google Maps calculated to be a 7 hour road trip, with my 1-year-old daughter and cousin from Toronto, Ontario to Columbus, Ohio. Plenty of time to make it to the support group session at 5pm, or so we thought. Turns out that traveling with a baby takes substantially more time. I was remiss to factor in the numerous stops to eat, change diapers, and of course to play... Add more time for pounding rain, accidents, construction and a dead car battery. It was a small miracle that we made it with an hour to spare! I was impressed to see about 40 people filling the classroom of Starling Loving Hall of Ohio State University. 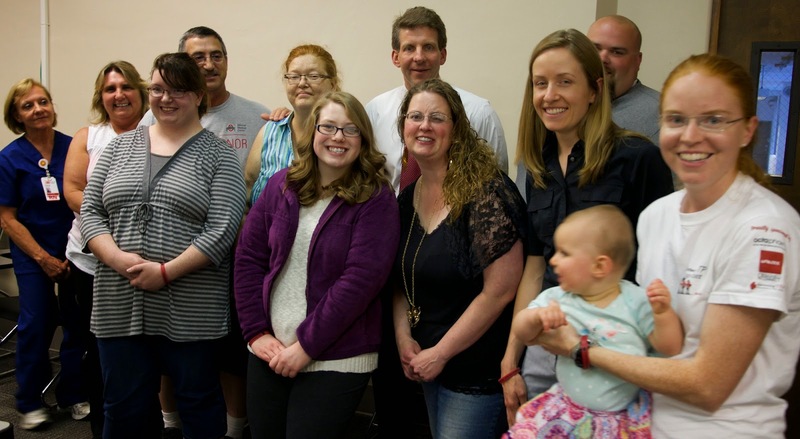 Patients and their families had traveled from as far away as New Mexico to attend. As a patient, I find that these support groups are an important component to patient well-being. I have found that these sessions help connect TTP patients, and their supporters, to others who truly have a mutual understanding of what it is to live with, or with someone who has, TTP. Group shot from support group. Dr. Cataland welcomed everyone to the meeting and discussed the similarities and differences between aHUS and TTP (click here to learn more). A number of patients in attendance had been reclassified as having aHUS after an initial diagnosis of TTP. Dr. Cataland also shared that the results of a study comparing the use of Prednisone vs. Cyclosporine together with Plasmapheresis will be released shortly. As a patient, who dreads the side of effects of Prednisone, I hope that Cyclosprine will be proven a good substitute for Prednisone in the treatment of TTP. I was thrilled to share updates from the Foundation with the group about our support, education and research initiatives. People loved the new hats that we are giving to patients and supporters who officially share their stories with us (click here to learn more). The attendees were excited to learn about participating in the 2014 Walk to Answer TTP Together on September 20, 2014 (click here for more details). I also took the opportunity to emphasize the need for more TTP community members to actively get involved with the Foundation. We have grown and need more active support from the community. It is time! Whether you want to get involved with advocacy issues, have a bake-sale or gala, support others or lend your services in some other meaningful way (click here to find your fit). It was a great trip and I hope to make it back in October for the more formal support group session that will be attended by a very special out-of-town TTP physician. Ensure you are registered for the Answering TTP Community (click here) so that we can send you the session information. I went to the meeting in June 2013. I suggested that you all attend Dr. Cataland's meetings so that information could be dispersed through your foundation. I am thrilled that it came to fruition, and I believe that, as a result, we all are on the same page. Thank you for your continued effort! I attended the meeting in June 2013. I suggested then that your foundation attend in the future, so that all information could be dispersed from the foundation. I am thrilled to see this come to fruition, and thankful for the information you have provided for all of us. Thank you for your continued effort on my behalf!!! Are you thinking of volunteering your time to a worthy cause? Do you want to really make a difference? We encourage you to get involved. The Answering TTP Foundation provides (1) a portal for all new patients to access local and national support networks, (2) a centralized effort to develop educational and awareness tools, (3) a common voice to lobby for patient access to the best treatment options, (4) a platform to share fundraising best practices, and (5) an umbrella to pool fundraising dollars to most effectively engage research.